16 ounce Kosher Aged in Wood Dill pickle. Our original pickle- the kind your grandparents used to buy from a wooden barrel at their neighborhood market. Available with or without garlic. Natural Flavors, and Calcium Chloride. From Anonymous of Littleton , Colorado on 6/23/2018 . Best pickles I’ve ever had. From Nikki Lang of Hollywood, South Carolina on 4/21/2018 . I was very excited to find genuine aged pickles without garlic (As I am garlic sensitive). When I received them I was disappointed to see that there was vinegar added as one of the ingredients. Since genuinely brined pickles do not need vinegar and are quite good for you because of their natural probiotics, I went back to the website to see why the added vinegar was necessary and learned that after the brining process they wash them ( there goes all the probiotics and the natural vinegar). As vinegar is added it has a different tartness than the naturally brined pickles without vinegar. It's a shame they ruin a perfectly good pickle. From Anonymous of Germantown, New York on 3/1/2018 . After years of searching grocery shelves, buying and trying pickles, finally found them. The added bonus was they offered garlic-free because I don’t tolerate garlic. My family and friends will be ordering next. From Cheryl Kinnaman of Dewey, Arizona on 1/29/2018 . Just a little less "bite than the Genuine Dills. Too close to call, loved both of them. 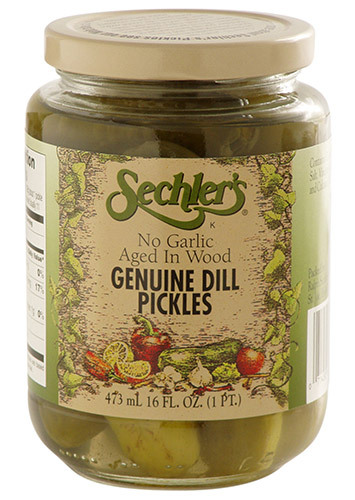 Have been ordering the Genuine Dills for years. From Anonymous of Mesa,az, Arizona on 10/24/2017 .